Tom: Alright, well, welcome, everyone, to the Client Mastermind session today. 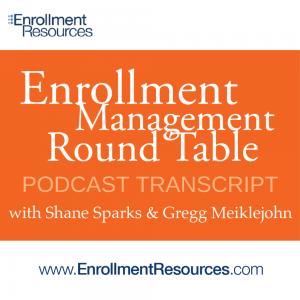 Joining me is Scott Spitolnick here at Enrollment Resources, and between Scott and I, we have many decades of work in admissions and admissions consulting. We’re gonna try to take you through the top ten responsibilities of a DOA, today, which is a topic that seems to come up quite a bit with us. Been getting a lot of good feedback. We really wanna share some best practices and some things for you today on how to be a more objective manager of your people and your admissions department, as a whole, to grow your enrollment. Tom: So what we will jump into today is really we’ll start with the role of a manager, and really the role of a sales manager is not to grow their sales but to grow their people. And really, a sales manager has three key roles, and Scott, I’ll let you jump in on a few of these after I mention ’em, but number one is being a manager of the people and to recruit, build, coach your team. To be a resource provider, which is giving your teams the needed resources to exceed their goals. And that could be anything from headsets, to calculators, to pencils, but to texting systems, predictive dialers, video chat, video email, all of the technology needed to be successful, as well as those basic resources. And then also be a business manager. Someone who can plan a budget and then adjust those plans and report up the chain as to what they’re doing. So those are really kinda the three key roles. Scott, any feedback on any of those or what you feel might be more important? Scott: Yeah, well, particularly the people manager, because sales manages, director of admissions, managing your team like any other sports team, if anybody has coached their kid’s soccer teams or baseball teams or whatever. You have the people in place, you build the team, but then it really, really is constantly coaching. And I know you’ve got some shocking numbers that we’ll get to, Tom, but it’s really amazing how little time is spent on continually coaching, continually monitoring our people, to make sure that they’re really the best that they can be. And also to make sure that they’re not short cutting the process. And as we all know there’s a process in admissions, and once you start short cutting those processes, that’s where we run into trouble. That’s when we have problems. We really, really do. Scott: I agree, resource provider. I challenge everybody out there, particularly the director of admissions, and collect, see, inspect what your reps are sending out through email, handouts, and I think you’ll be amazed at the different pieces that each one of your team member is sending out. So I think it’s imperative that those things are standardized, not only from a marketing standpoint. You wanna shed a good light on the school with the materials that are going out, but also from a compliance standpoint. Scott: Again, I think it’ll amaze you on some of the things that are going out without you really knowing it. So I really challenge everybody to collect whatever a rep is sending out or handing out and standardize that after you’re running it through your compliance office. Make sense? Tom: Yeah. All good points, yeah. Good stuff. Scott, you touched base on some statistics about management, so that’s something we’ll just dive into right now. There’s a couple really key striking stats that I found out there on managing people in the sales environment, and we find that about 82% of managers don’t have time to train their people. And I think, Scott, you were alluding to this a little bit, but and really a lot of managers get so caught up in things that they just don’t work to train their people. They’re so busy with the numbers and the reports and all the admin work that they have to do. In fact, 23% of managers time is actually spent on admin activities and 32% of a manager’s time is actually, it’s spent on desk-based activity. Tom: So anywhere from a quarter to a third of a manager’s time is gonna be at their desk and mostly working on admin stuff, and only 14% of manager’s time is actually, is spent directly with those reps or with the customers. It’s a really small amount of time. So we wanna make sure that, I think today, one of the jests of this is, and Scott mentioned it as well, that we get out and manage our team and work to coach our team and we’re gonna jump into that next. Tom: So the purpose of today is really to go through 10 key roles of an admissions DOA and I’m just gonna run down these and then we’ll jump into them, but number one, knowing your KPIs, knowing your numbers, and we’ll talk about that. Number two, ensuring that you have a sales structure and a process in place that your people can follow, you’ve got a roadmap for them. Having a starts and enrollment plan, knowing where you wanna go. Number four, having a weekly rep report that ensures your reps know their numbers and that you’re gathering numbers, weekly. Tom: Then five, having a report summary that takes all of those weekly numbers and tracks the KPIs for all reps as individuals and in groups, so that you can plan for training and coaching opportunities. Number six, we want you to be able to have a starts planning and adjustment tool, and we’ll talk a little bit more about what that is, but we want you to be able to adjust your activity level to meet your start goals or exceed your start goals, hopefully, and we’ll talk about how to implement something like that. Tom: The seventh key here is to make sure you’re using scripts and AB test them. So we’ll talk a little bit about those scripts and what AB testing is. And here in Enrollment Resources, that’s a big hallmark of what we do when it comes to conversion rate optimization. So AB split testing is a key in any area of admissions or marketing. The eighth one, holding some daily and weekly sales meetings, and we’ll talk about how those get implemented and what to do during those meetings. Tom: Number nine, being a coach. So actually coaching your teams. This is not having a meeting, this is the coaching part. So daily, weekly, what are some of the reviews and improvement plans you put together, and how do you coach your team. And then the last thing here is how to audit your team. So now that we’ve got all of these things in place and we can coach our team and they’re hopefully following our processes and scripts and they’re doing everything or looking at their KPIs or training them, how do we know that they’re actually doing what we put in place? So, auditing your teams. Some mystery shops and some post-tour surveys. Just a few things out there that you can do to make sure your team is on the ball. Scott: Yeah. Well, I was gonna ask you, Tom, real quick, and I know we deal with a lot of different schools. We talk to a lot of different people, and I have found majority of the people that I speak with, they don’t know their key performance indicators, their KPIs, and that’s really key to the whole thing and how to manage your people, how to manage your department. It’s knowing your KPIs, so again, if anybody out there does not know their KPIs, I would really, strongly suggest that you get to know them. And they’re not that difficult to compile as well. Do you agree, Tom? I know a lot of the people you speak to also really don’t have a really good handle on the KPIs. Tom: No, absolutely true. If you can’t put your finger on your key numbers in a moments notice, as a sales manager, I mean you should have those things flashing in colors up on a screen all day long, if you can. But you gotta know those numbers. So, Scott, you’re absolutely right. In fact, Scott, why don’t you kinda take us through the six main KPIs that we really wanna make sure admissions and managers know. Tom: … Do you actually make contact with? Scott, you back? Scott: Yeah. Can you hear me? Tom: I can hear you. Might be having some technical difficulties with Scott. Scott: Yeah, I don’t know. But, yeah, as I was saying, we make admissions into something a lot more difficult than it really, really is so. Knowing the lead contact rate, first and foremost, if you give a rep a specific number of leads, let’s say you give them a hundred leads, it’s key to know how many they actually contact. Over the phone. I’m not talking about emailing or texting, that’s just sending it out. But how many do they actually speak to. Tom: Oh, Scott, you still there? Tom: You’re cutting in and out, Scott. Tom: So, maybe I’ll take this one and finish it up as Scott gets tuned in here. So your lead contact rate, number one. Number two, we wanna know what the appointment set rate is. So what percentage of students that you’re actually getting a hold of or making contact with, do you actually set an appointment with? Tom: Number three, what’s your appointment show rate? So, of the people that you actually talk to and set appointments with, how many of those people actually show up for their meeting or their tour? The fourth one is the application rate, so the people that show up for a tour, how many of those people fill out an application? And then the fifth one is your enrollment or packaging rate. So what percentage of those people who apply, actually get package, complete their financial aid, and get accepted at your school? And then finally, the sixth one is your start rate. So what percentage of these enrolled students actually show up to class on day one? Tom: So those are kind of your six pillars, your six key KPIs to be watching. Three of those are most important to me, and one is the appointment show rate. So what percentage of students, or I’m sorry, inquiries that you receive, actually show up for their appointment? What the application rate? Which is basically your closing rate. How many of the people that come in for a tour actually get closed and fill out an application or start the application process? And then finally, start rate. How many of those people that start, or that apply and get enrolled, actually show up on day one for class? Tom: So those are our six KPIs that you should know as an admissions manager, day in and day out, and have those at your fingertips at all times. I’m not sure if Scott’s back or not yet, I’ll keep going. Scott: Yeah, I think I’m back, Tom. Tom: Alright. Well let’s jump into, kind of the sales structure here, Scott, and it’s really key to have a process and a structure in place for your team to follow, a roadmap for them to follow. You wanna kinda comment on that and let me know your thoughts? Tom: Alright, Scott, you are having some significant technical difficulties. Tom: So, Scott, I’ll kinda take us through here real quick and we’ll keep moving as you work on that. I want you to get your people your processes right here. We find that it really helps, these days, I think to separate your people in admissions a little bit. We’re finding that appointment setters, separate from admissions reps, is a great separator. ‘Cause not everybody is great on the phone, or do they like the phone, and some people are really great face to face. So we wanna actually have those people that are good on the phone, willing to make those calls, willing to set appointments, be able to kinda push through some of that rejection of making lots of calls and getting little response at times. It can be frustrating. Tom: I know, personally, I love face to face. I love to sell to people, but I don’t love to dial the phone. It’s not my strength. It’s not what I’m best at. I can do it, but there are other people that are really great on the phone. So having appointment setters, separate from the admissions reps, can be key. Tom: And then, also potentially having future student coordinators on the backend that can take those people that have enrolled and help carry them all the way to the finish line and get them to start. So those are some key ways to structure your department, and then from the process standpoint, making sure that you’ve got an appointment setting process and script set. What’s the process? When do they call, email, text, leave voicemails? How often do they call? When do they call? What’s the cadence of all of that? And then having the scripts for that. What’s the appointment setting script? What do we say? How do we greet? How do we transition? How do we close? How do we set that appointment? Tom: Having your emails scripted, your texts scripted. And I know a lot of the feedback that I get sometimes when we talk about this with people is, oh we don’t want them to be robots, we want them to be themselves. Tom: This with people is, “Oh we don’t want them to be robots. We want them to be themselves.” You know what? I would like you to be yourself and not be worried about what you’re going to say or how you’re going to handle that call. Because if I give you the road map and you practice and good at it and I give you the exact right script with the right tone and verbiage in it to inspire people, you’re going to be so much more confident and able to get through that call a little bit better with a much better attitude which will show up in the climate setting. Tom: As well as having a script for your interviews, a script for your tour. When you take people through your building. What the path that they should follow? When should they stop? When should they take selfies? When should they see a signature moment or something they want to take a picture of? What should admissions say? What should career services say? What should student services say? I want to have everybody scripted like Disney World. Everybody’s got a job in a script so that nothing is left to chance. We don’t get noncompliance and we don’t get off track. Everything leads to a logical conclusion of helping the student make an informed decision. Also, making sure follow up plan scripts are in place. Tom: The next thing we’ll touch base on is having a start plan. Now we’ve got our people and process set in place. We know what KPIs were going to be watching. So simply, we need to put together a start plan. This is our plan, our budget for the year. What’s our growth targets and then for those targets that we want for enrollment, we kind of work backwards to set enrollment targets. We know what we want for starts and then we want to work backwards slightly to set how many enrollments we need. Now I have an enrollment target by start date by program. We want to make sure those things are in place for our team to work from. I’m going to be a little bit more aggressive on my start target. I’m okay if I’m short but I would rather exceed and set a little bit higher goals than to set really realistic goals that I could easily achieve. From a financial standpoint, there could be a start spot. But, for admissions, I want to probably pump that up a little bit so I can try to exceed my numbers and over enroll if need be. At least I have a plan to work from. Tom: Scott, don’t know if you joined again or not? Scott: I’m here. But for how long, I don’t know, Tom. I apologize. Tom: Let me talk about weekly reports, here. Then you can jump in on these weekly reports. One of the things we want to look for is we want to track what our people are doing on a weekly basis. In order to monitor our six KPI’s I need an easy tracking system and hopefully a CRM that I can put this data out of. If not, a spreadsheet than an admissions rep can fill out taking them about one minute everyday and the end of the day of how many calls, texts, emails. How many people did they make contact with? How many personally developed leads do they have, that they’ve generated. How many interviews? How many people enrolled? And, really tracking that because I think, even though that data might be in your CRM and easy to pull through, I think it’s out of sight, out of mind for the reps. They’re working throughout the day and that information is going in, but I think when they sit and the end of the day and have to put in all of their info for the day, that they kept track of, which only again takes only takes a few minutes to do, I think it really brings it front and center to them and they hold themselves more accountable when they really see what they’re doing. But then you’re going be able to aggregate that data as well for the reps.
Tom: Scott, any comments on tracking that stuff daily? Scott: Yeah, again it’s really important to track daily. I used to go one step further and we would give a goal to each one of the reps, whether its three appointments set, four appointments set, for each day. It’s called winning the day. That way, you don’t have to worry about what’s going to happen next week or the week after or for the start. If you can win that day everyday, I borrow that term from Bill Clary. If you could win the day by setting the three appointments or four appointments, everything else is going to really fall into place. It really, really will. Again, I would also when you aggregate the information at the end of the week, every Friday, give a copy to the whole admissions staff with everybody’s statistics on it. Reps are very, very competitive. They are their worst critic, as well. But, when you put it out there for everybody to see, again, it’s a great way to get a little bit of competition going and let people know they need to do for the following week. Tom: Great point. I love the fact that you want to be transparent and let everybody see what everybody is doing. It does give some competitive juices going. I also like the fact, Scott, that you pointed out that you focus more on appointments and not as much on the end result of, “Hey, I need five enrollments today.” As soon as you start focusing on enrollments or starts, then people have a tendency to lose track of why they’re there to begin with. They start trying to enroll anybody to hit numbers. So, if you’re focusing on appointments and you hit your appointment goals, most likely you’re going to achieve your enrollment goal. But you’re not putting that pressure on the rep to “Hey, I need five enrollments this week.” And then all of a sudden they miraculously pull out five enrollments of which two of them were horrible and they should have never enrolled. You put the emphasis on the right thing there. Let’s get appointments. We’re going to talk about that in a few minutes as well. Really good insight there. Scott: Tom, just one more addition. I know a lot of schools that really, really put an emphasis on you have to make 50 calls. You have to make 75 calls a day or 100 calls a day. I never really understood that because that turns the reps into where all they’re worrying about is dialing, dialing, dialing, and not concentrating on setting the appointment making the contacts. I know when I was running admissions departments, I didn’t care if they made 5 calls or 10 calls. If they were getting 3 or 4 appointments a day, then hey, whatever it took. That would be old inquiries, new inquiries, referrals, whatever. If the goals was to set 3 or 4 or 5 appointments a day, then who cares how many phone calls they’re making? Tom: Absolutely. Totally one-hundred percent agree with that. It’s really on the effort needed and I’m not going to worry about how many phone calls if your able to produce, I don’t care how you got there, necessarily. Good points on that. Tom: The next thing we’ll talk about is having a start planning and adjustment tool. Having a tool whether it be a spreadsheet or just a sheet of paper that you work from on a weekly basis. I want to know how we’re doing for each start that’s upcoming? Maybe you look out 30, 60, 90 days, depending on how many starts you have in those time periods and what your cycles are. But, I want to know where we stand for each start and what we need to achieve for each start. Tom: We can help you guys with an adjustment tool, but one of the things we want to look at is what’s our start goal? How many applications do we need to get to hit that start goal? We take our start goal, we divide that by our start rate. If our start rate if 90 percent, we need 10 applications or ten starts, then I divide 10 by 90 percent and I’ll get what my total applications are needed. Then what I’ll do is I’ll subtract how many applications I already have from that application number so I’ll know how apps I still need to get. Then I can divide that number by my closing rate, my application rate, to see how many interviews I need to set up. I can divide that number into how many weeks are remaining to see exactly how many interviews a week I need to be setting or I need to have show up so that I can hit my goals. Tom: Then, I’ll break it down as Scott mentioned, I want to know about appointments. Actually, take a look at okay we know we need let’s say 10 interviews a week to get our start goal. How many appointments do we need to get 10 interviews a week if you have a 50 percent appointment show rate, then obviously you need 20 appointments to be set. If you have a higher appointment show rate, of 80 percent, then you need a lot less. We want to make sure that we know, and I’m breaking it down by appointment. I want to know how many appointments I need a week to hit my start goal. That’s really what it boils down to. My focus is primarily on appointment sets. That’s where my focus lies. Because, if my people do everything correctly, we’re going to enroll. We’re going to start the people and we’re going to hit our numbers. But the most difficult thing, I think, in admissions is appointment setting. Knowing what your appointment sets are a week. Scott, is that you in and out there? Scott: I’m here. I think I’m staying pretty steady. Tom: Go ahead. Scott’s breaking up again. We’ll keep moving here as we move through this. The next thing we want to make sure we’re doing is we want to ensure the use of scripts and AB testing of them. I want my players to have a daily plan. I want to train them daily because, again, 82 percent of managers don’t have time to coach or train their reps. I want to have a script. I want to observe my people and I want to pass an AB split test those scripts to make sure if hey if I can give them a better resource or a better tool to work from and make them more successful then I’m going to do that. Tom: Hopefully, they’re reps with a great learning mindset and their willing to want to learn and try some new things. That’s going back to one of the traits of a rockstar admissions rep that Greg Meiklejohn and Shane had done many years ago. A learning mindset was one of the key things that we looked at from an admissions rep. I want to split test. I want to give them the best resources I can. That’s why I’m giving them a script and I’m scripting out their emails for them. So that they’re not using something of their own making that they think is great but it really is inefficient or doesn’t work. I want them to use the tools that I know will work but I’m going to continually try to work to improve those tools. Those are some of the things that we definitely want to pull off as far as the AB and split testing. Tom: The next things we’ll jump into here as we come down the last step. The last three things that we want admissions DOA’s to be able to do is. This section is so important to me, having a daily and or weekly meeting with your team. Great teams don’t just take the field and play, they practice daily. They watch film. They plan. They train. They lift. They workout. They dribble. They do whatever it is to improve their technical and tactical skills. They do it daily. Why don’t we do that in admissions? Tom: I strongly advocate that we should have a daily meeting. Maybe that meeting’s 20 minutes long. No longer than that. We don’t want to meet ourselves to death. Just a 20 minute meeting. We review our numbers from the day before. We talk about some success stories of some of the people we enrolled the day before and where they came from and what they want to do here, and get excited. We want to maybe look at some of those areas that we’ve used those rep reports to find where our reps are struggling. We’ll identify an area of focus and maybe we’ll role play on that for 10 minutes. Tom: Ten to 12 minutes of role playing daily. Now that sounds like an awful lot to many people, but it’s really not. If you’re only spending 10 minutes a day role playing and training your people, that’s insignificant. That’s such a small number. They’ll add up over time. But, you’ve got to do it because that’s really where your people will start to hone in and be able to do things without having to think about them. It will become second nature to do it right and they won’t have to think and possibly go off the rails so much. Tom: Definitely, if you can’t do a daily meeting, have a weekly meeting where we review numbers. We set some goals. How many appointments do we need the following week to hit our revised numbers? How do we work with other departments to improve our process? So, maybe we have some weekly meetings as well. If you can’t do the daily, definitely have a weekly and definitely role play in either one of those meetings. Tom: Another strong reason for a daily meeting is everybody brings baggage to work. People come to work with all kinds of personal troubles and trials and tribulations that they’re dealing with. Maybe it’s a family member that’s ill, sick or recently passed away. Maybe it’s money troubles, car troubles, transportation troubles, child troubles, friend troubles, whatever it might be. People bring baggage in and when your job is to talk to prospects and talk to customers all day long and put on a really great face and be excited to ant to work with them, you gotta change that mindset. So having a daily meeting every day for 10, 15, 20 minutes to get their mind right, get them thinking about what they have to do to be successful. What do we gotta do today? Let’s train. Let’s role play. I’ve now forgotten everything that came in. I’ve left it at the door. I’m now fully engaged in admissions. You know what? Give me the phone. Let me go. I’m ready to roll. Scott: I think I’m back with you. Having a daily meeting is crucial and there’s a resource that most schools have that’s really, really under utilized. A lot of schools record their calls. This call may be monitored from call tracking, call monitoring or whatever. It’s a great opportunity to take a few of those calls, good, bad, indifferent and play them at particularly the weekly meeting. Three or four phone calls. Some that are good. Some that maybe the appointment wasn’t set and let the reps critique each other on it. “Hey, I do this,” or “You may have want try that.” It’s kind of almost like a self training as well with the whole group. Tom: Yeah, absolutely. I can’t stress. That’s what builds a team. Tom: Absolutely, I can’t stress- That’s what builds a team, it’s this daily training. That’s what builds repetition of the right things. It reinforces the right things. It builds that team and it creates a learning environment. Tom: The next thing we’re gonna touch base on here is number nine- was being a coach and, Scott, you just ran right into it. Great coaches, they train their players daily and effective at getting their people to perform at a higher level, and the three areas that we do talk about when it comes to coaching is- I want to improve people’s technical skills. I don’t care if it’s sales, soccer, football, tiddlywinks, whatever you may be training somebody on, the technical skills. How well can they do what’s required? What is their skill set like? Have you improved their skill set daily? Did you train ’em when they first came on board, or did you just throw them to the wolves? What are you doing daily to improve those people on their technical skills, on how to do the job? How well did they do the job, is what I should say? Tom: The tactical stuff is how to do the job. Do we make sure that they have a process in place for them to follow? Just like on a football field, you’d diagram plays, the sales process is you diagram the process. How often do you call? When do you dial? When do you leave a message? What’s that message? You have to give them the plays needed to be successful, that you know will work. Tom: And then the last part is the mental and physical aspect of the game that we have to train them on. And for admissions and sales people, it’s how do we encourage them? How do we motivate them? And then, can they communicate with others and follow the process and do they wanna learn? So, Scott, you touched on a couple of these things earlier, but we wanna make sure we’re improving their skill set daily and we are coaching them on process or giving them a play book to follow. Scott: Yeah, and Tom would you agree that not only the training, of course the training is important, but following up on the training. I used to sit with my reps through presentations when a prospective student would come in, I sat in the corner and I just observed and listened. So training is one thing, but it’s also monitoring what their doing with that training as well. Scott: I know you probably sat through many presentations of your reps as well, Tom. You know, as a follow up to that training. I can’t stress how important that is. I don’t know how many people are doing that. If your now, well, maybe you should. Sometimes it’s a little intimidating or it may feel intimidating to us to be in there with the rep and the student. But you know what? If you handle it right from the outset, it works out fine. Tom: Yeah. That, again, Scott prescient of you two to know exactly what we’re talking about, next. Because that’s really auditing your team, so this is really- We want to coach our team daily. We wanna put the plays in the place and we want to practice those plays. And then, I also want them to work out and get stronger and fitter, you know again giving the sports analogy. Tom: On the admissions and sales analogy is- Again, I want them to have a process and scripts to follow so that they have the game plan. And then, as where as an athlete needs to increase size, speed, and all of that. The sales and admissions person, they need to increase their ability to communicate. They need to be able to roll play and train on the greetings, the closings, the transitions, all of those things so that it becomes second nature. That’s really what coaching people is. It’s to help the actions that make you successful become second nature so that you don’t have to think about them. And part of the coaching, as Scott mentioned, is observing your people. Tom: So the last tool that we’re gonna talk about is really auditing your team. There are many ways to do this and Scott mentioned one. That’s observations of your people. Are you sitting in and observing them? Do you walk with them when their doing a tour? Do you sit in when they’re doing an interview? Do you listen in while their on the phone? Are you observing and auditing and inspecting what you expect of your team? Tom: Other types of things that you can do are mystery shops. Scott, you wanna talk a little bit about mystery shops and what the benefits are of mystery shopping? Scott: Yeah, you know, one of the first things that I do before I even speak to a school that is a potential client of ours, I mystery shop their school. I go to their website. I fill the opt-in form out, and I wanna know how long it takes for the school to get back to me, particularly a phone call. It amazes me in some cases, it’s several hours, some cases it’s a day or two, and in some cases it’s within minutes. So, again, that’s critical. You know, getting back to the prospective student as quick as possible is just critical on whether you have a good shot to set the appointment. So, I mystery shopped my own school when I was running schools. Scott: I also had my reps, this may sound off the wall, but I also had each and every rep mystery shop the competition. I wanted to know how my competition was selling against me. I want to know what they were selling. I would have a friend or my brother or whomever, call my competition and act like a prospective student. I used to have them say, “Well I’m thinking about going to ABC school.” Because I wanted to know how they were selling against me as well. So I know that goes a little bit beyond the bounds, but I think that’s an important part of the puzzle also, is knowing what your competition is saying about you, and how they are selling against you as well. So, does that make sense, Tom? Tom: Yep. It’s a good point. So we wanna mystery shop and really having a third party do that. You can do your own, and you should do your own mystery shopping of people, and also having a third party do it. It’s something that we do here in enrollment resources for clients. We can mystery shop for them. It gives them some great insight as to how their teams doing and are they really following the process. Tom: Other ways to do it would be a post tour survey. Something we do in our virtual advisor product here, it’s one of the tools in that tool kit, is a post tour survey. As soon as somebody leaves your facility, after an appointment, whether they enrolled or didn’t enroll, we wanna survey that prospect. We wanna know how did things go? What the rep on time? Did the rep discuss and ask enough questions to them? Did they feel comfortable that they understood the ins and outs of the program? Did the rep promise them graduation employment? Did the rep promise them they were- a certain salary that they would make? Just little things that could get us into some compliance trouble. Were they on time? Were they friendly? Did you feel that they give you enough information and that they set some correct expectations? Scott: … critical. Director of first impression, the reception desk, that’s an integral part in the admissions process. Tom: I’d even go so far as to ask them, was it easy to find? How was the drive? Did you find it easy to park and walk in the front door? Was it easy to find? Did it look like a clean and inviting environment to walk into? Even those things can give you some great insight that, “Oh man, our parking’s terrible, they can’t find the front door, and there’re litter all over the place before they even walk in the door.” So I think some of those things can really pay off and help as well on those- Those are great points. Tom: Other things you can find out was, did the admissions rep set the right expectation? Is this what you thought it was going to be from your admissions rep? And if not, it gives us another great opportunity to do some training. But that training only comes after we adjust the plan and the process to include making sure that we have dealt with all of those eventualities. And then, we go ahead and we train on our updated plan. That’s right. Scott: Yeah and I know a lot of schools do it, a lot don’t, but even having the director of admissions, the senior rep or whatever, doing an interview with the student who just enrolled, before they walk out the door. “Hey, I just want to get to meet you. This will only take five minutes. Did Tom talk to you about career services? Did Tom talk to you about financial aid? Did Tom talk you about homework or whatever?” You can have a list of seven or eight questions to do kind of a- not a second cell, but an enrollment interview or post enrollment interview or whatever. Scott: That’s really, really effective to finding out what the people are saying, but also gauge the temperature of that perspective student or that perspective star as well. And that could also help identify some red flags. Asking about day care, transportation, and things like that just to get that student a little more locked in. Tom: Yeah, very good stuff. So that really sums it up for us today. Taking you through those nine things that we- or ten things really that we think admissions DOAs need to be doing. And just to kinda summarize, number one, know your numbers. Know what you’re supposed to be hitting. What are your best practices? Tom: Number two, having a great sales structure and process in place for your team to run on. Tom: Number three, having a start and enrollment plan, so you know what your number that you need to hit for enrollments are but start. Tom: Number four, having your reps reporting daily so that you could see exactly- Hold them accountable, make sure the numbers are in front of them and then adding those things up weekly to make sure that their hitting their numbers, or that you’re able to look at their numbers and see where they may have fallen down. Tom: And then, number five, summarizing those things on an ongoing basis so that you can see what areas of weakness your reps may have, and where opportunities for coaching and training may come in. Tom: Number six was using a starts plan and adjustment tool to take that enrollment plan you had earlier and see what you need to do to adjust to exceed those numbers each start moving forward. Tom: And we want, seven, ensure that we’re using a script and testing it. Constantly innovating and trying to improve the tools that we’ve given reps.
Tom: Number eight, holding a daily meeting to help create that mindset of being ready to go each day. And definitely weekly meetings that can be used for training, and try to role play as much as possible. Tom: Nine, being a coach. Coach your people daily. Get outta your office. Don’t be the thirteen percent that only- thirteen percent of people that actually work on training their people. Spend eighty percent of your time training and coaching your team. Stop doing all the administrative tasks. As soon as you can get out of that administrative task role and work on people development, that’s when your admissions will explode. And I mean, you will explode. It’ll double your enrollments in a short period of time. Tom: And then ten, audit that team, inspect what you expect and understand where your team is on numbers. And also, are they following your processes that you put in place? ‘Cause those are the people we wanna have. Tom: So that’s it for us, Scott, any last comments? Anything to kinda sum up what we’ve done? Scott: Nope, Tom, you’ve said it all. That was a great summary. So thanks everybody for joining us. Tom: Awesome, well appreciate you listening and tuning in here to our webinar. If you have any questions please feel free to reach out to either Scott or myself or anyone here at Enrollment Resources. You can find us at enrollmentresources.com and phone number 250-391-9494, we’ll be more than happy to see if we can help you and your DOAs and management implement some of these processes for yourself. Thank you very much.